It’s been a great start to Autumn sporting fixtures for Sydenham High Senior School teams. In the first cross country meet of the season, Sydenham High year 10 runner Ellie Osmond trounced the opposition and took first place against a strong field from JAGS, Alleyn’s and Streatham & Clapham High. Tilly Stevens Cox (year 9) and Kayla Victor (year 7) – one of the youngest competitors – were in the first ten runners to cross the line and all year 9 and 10 runners finished in under 10 minutes. There was triple success for Sydenham High teams in the first GDST rally of the year too, hosted by Blackheath High. Our tennis doubles team (Millie McLeod year 8 and Morgan Lee year 9) won all their games. 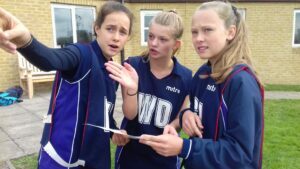 Our year 9 orienteering team (Charlotte Nevrkla Wood, Morgan Lee, Emily Walsh and Ellie Othen) showed exemplary skill in coming first in their challenges, whilst our year 8 and 9 combined hockey team took the top slot beating Ipswich High, Blackheath High and Bromley High and drawing with Croydon High. Girls from years 8 and 9 took part and great fun was had by all. Our netballers have also had an encouraging start to their season. 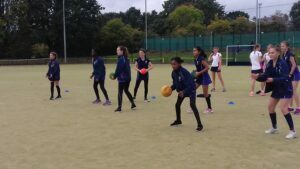 Although they didn’t win their first match – against Bromley High – they showed huge determination and fought their way back into the match, coming out on top in the last quarter of the game. For year 7 their match, against Sydenham Girls, was a different matter as they won convincingly with Tilly and Gabby named players of the match.